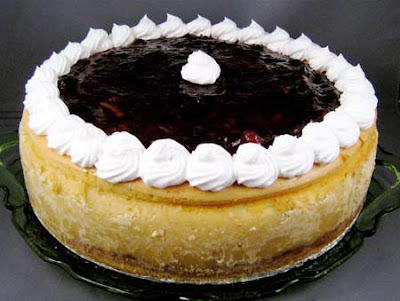 Discription:This is very tasty cheesecake.Try it and Enjoy!!! In a small bowl, with mixer at low speed, beat flour, butter, sugar, egg yolk and grated lemon peel until well mixed. Shape dough into ball; wrap with plastic wrap and refrigerate 1 hour. Press 1/3 of dough onto bottom of 10 x 2-1/2 inch springform pan; keep remaining dough refrigerated. Bake crust 8 minutes or until golden; cool in pan on wire rack. Turn oven control to 475 F.
In large bowl, with mixer at medium speed, beat cream cheese just until smooth; slowly beat in sugar, scraping bowl often with rubber spatula. Add eggs, milk, flour, egg yolks and lemon peel; beat 5 minutes, occasionally scraping bowl. Press remaining dough around side of pan to within 1 inch of top. Pour creamed mixture into crust. Turn oven control to 300 F.; bake 35 minutes longer. Turn oven off; let cheesecake remain in oven 30 minutes. Remove cheesecake from oven; cool completely in pan on wire rack. Cover and refrigerate at least 4 hours or until well chilled. When cheesecake is firm, with spatula, loosen pan side from cheesecake and remove; loosen cake from pan bottom; slide onto serving plate. In a small pan, on low heat, mix together cranberry sauce, marmalade, sugar, nutmeg until it just comes to a boil. Top cheesecake with sauce and chill for at least 2 hours.